Colton Underwood surprised Bachelor super fan Brittany Snow on last night’s (April 17) episode of Busy Tonight! 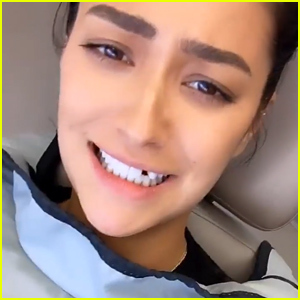 Brittany appears in the segment alongside her Someone Great co-star DeWanda Wise and plays her version of Chris Harrison in this mock final rose ceremony — but Colton shuts it down. Colton Underwood Jumps a Fence–Again! | Busy Tonight | E! Jordan Peele Joins 'Twilight Zone' Actors at Hollywood Premiere! Jordan Peele walks the carpet at the premiere of The Twilight Zone on Tuesday night (March 26) at the Harmony Gold Theater in Hollywood. The Us and Get Out director is one of the executive producers of the reboot for CBS All Access and he was joined by the show’s many actors – Ike Barinholtz, John Cho, Taissa Farmiga, James Frain, Ginnifer Goodwin, Zabryna Guevara, Percy Hynes-White, Damson Idris, Greg Kinnear, Luke Kirby, Sanaa Lathan, Kumail Nanjiani, Rhea Seehorn, China Shavers, Jacob Tremblay, Erica Tremblay, Jefferson White, Jonathan Whitesell, and DeWanda Wise. Zabryna received support from her friend Sterling K. Brown while Kumail was joined at the event by his wife Emily V. Gordon. The first two episodes of the series will premiere on April 1 and additional new episodes will be available on demand weekly beginning on April 11. FYI: Ginnifer is wearing a Brock Collection dress and Melinda Maria earrings. Zabryna is wearing an Eliza J dress and Stuart Weitzman shoes. Luke is wearing a Dzojchen suit. Gina Rodriguez, Brittany Snow, & DeWanda Wise Star in 'Someone Great' Trailer - Watch Here! The first trailer for Gina Rodriguez‘s new Netflix movie Someone Great was just released! 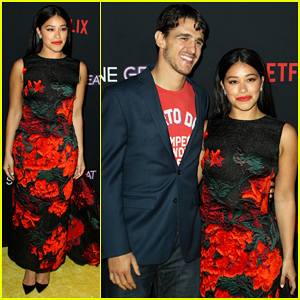 The 34-year-old Jane the Virgin actress stars in the film alongside Brittany Snow, DeWanda Wise, and Lakeith Stanfield. Someone Great hits Netflix on April 19. Watch the trailer below! Katy Perry and Chris Evans pose for photos while stopping by the CAA Pre-Oscar Party on Friday night (February 22) at the San Vicente Bungalows in West Hollywood, Calif. It was a star-studded night for the talent agency’s party with tons of stars stepping out as they prep for the Academy Awards. Some of the other celebs included Melissa McCarthy with husband Ben Falcone, Ciara and Russell Wilson, Sofia Boutella, Molly Sims, Tracee Ellis Ross with brother Evan Ross, Jesse Williams, Willem Dafoe, Brian Tyree Henry, Emma Roberts, Shameik Moore, Antoni Porowski, Billie Lourd, Corey Hawkins, DeWanda Wise, Trevor Noah, Sarunas J. Jackson, ASAP Ferg, and ASAP Rocky. Though they aren’t pictured, Taylor Swift and her boyfriend Joe Alwyn were both seen at the party, as were Jennifer Aniston, Gerard Butler, Lady Gaga, Bradley Cooper, and Leonardo DiCaprio. FYI: Guests at the party sipped on Heineken and Absolut Elyx. 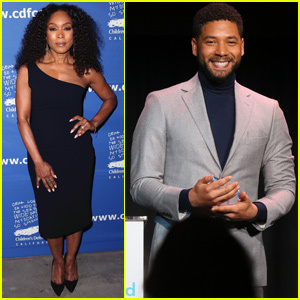 Angela Bassett and Jussie Smollett are helping to honor some special high schoolers! The duo stepped out for the Children’s Defense Fund Beat The Odds Awards on Thursday night (December 6) at the Skirball Cultural Center in Los Angeles. They were also joined by Jurnee Smollett-Bell, her husband Josiah Bell and Alfre Woodard. Other attendees included Aisha Hinds, Garcelle Beauvais, Tory Kittles, DeWanda Wise, Conan O’Brien and his wife Liza. The annual event celebrates five Los Angeles high school stars, in recognition of their excellence in academic achievement, despite the obstacles that stand in their way.